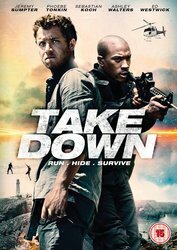 Take Down, starring Jeremy Sumpter, Phoebe Tonkin, Sebastian Koch, Ashley Walters, Dominic Sherwood and directed by Jim Gillespie is out now. To celebrate, we are giving away 10 copies of the film on DVD. Take Down is a thriller focused on the wayward sons and daughters of international billionaires, who have been sent by their frustrated parents to an exclusive, tough-love boot camp on a remote island, where they will be taught basic survival skills in the hope it will teach them to take responsibility for their lives. When they are taken hostage and held for a billion dollar ransom by a group of sophisticated kidnappers, the young captives suddenly need every bit of their brief training to survive. For the chance to win, simply answer the question below. The competition closes at 23.59 (GMT) on Wednesday 7th September 2016.